It's been such a wonderful day. I'm feeling like the little sculpture above. I have taken a giant leap of faith and everything has turned out just as it should be. Sylvia has given me such a 'soft place to fall'. I have been thinking, and I believe this must have been pre-programmed as well. When I think of going to my little Quinta de Luz in the middle of the night, alone with Habibi, nothing but a bed I wonder if it may have been difficult and felt very strange. Although I was so excited to do just that, now when I ponder what it might have been like, being with the lovely Sylvia is such a gift and has given me time to adjust to de Luz, have the finishing touches done, have shelving built so I can unpack, buy a wardrobe so I can hang up my cloths. All these wonderful things can almost be in place, instead of stumbling into a cold, dark, strange place in the dead of night. Such warmth, hospitality and support. Thank you, Sylvia. This morning I went to Centro to do a few little errands. First stop, Juans' Cafe, "Etc." for a huge cup of cappuccino. While reading the paper and enjoying the beautiful morning sunshine under an umbrella a woman came in and asked if she could join me. Naturally, I said "Of course, this is San Miguel." She is an artist who teaches encaustics. Fate has stepped in again. I was just discussing this with my friend in Alberta while I was in Canada. 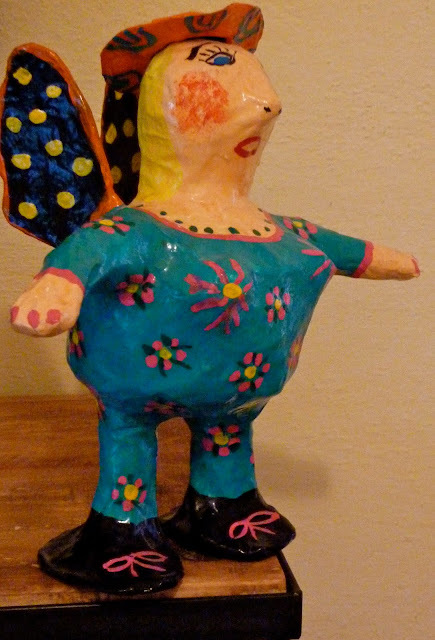 She is taking an encaustics class at U of A. It sounded fabulous and had always interested me. I was looking for a teacher. We spent a wonderful hour chatting and getting acquainted while Juan ground two kinds of coffee beans for me and mixed them together. 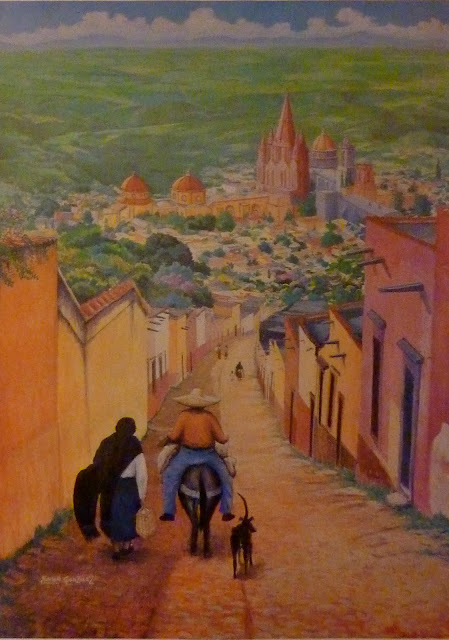 On my way out the door I bumped into another woman artist whom they are including in a book about the Artists of San Miguel. All in all, the magic is back ... I can feel it .. I can taste it ... all is well in my world! Big breath .... AHHhhhh! Wandered over to the artisans market to look for a gift for another friend who is having a "Fiesta", house warming tomorrow. As she now has balconies and is hunting down plants I chose two brightly coloured telavera planters for the wall. I hope they are pleasing to her. There will be more about the Fiesta tomorrow. I'm ready for a party! This evening we dined on the terrace outdoors. Had fresh shrimp stir fry on rice. Sylvia has a stash of 90% dark chocolate which we consume slowly, in small bits for dessert. It is amazingly wonderful, satisfying and does not leave you craving more as there is hardly any sugar in it. Made by Lindt. Try some. In my room at Sylvias, there is a lovely old painting. While admiring it today, I realized it is painted from a vantage point very close to this house. I will leave you with the 'old' San Miguel. When researching quotes on "Finding ones' place of belonging" tonight, I fell upon this one. It is exactly the way I feel at this very moment in my life.